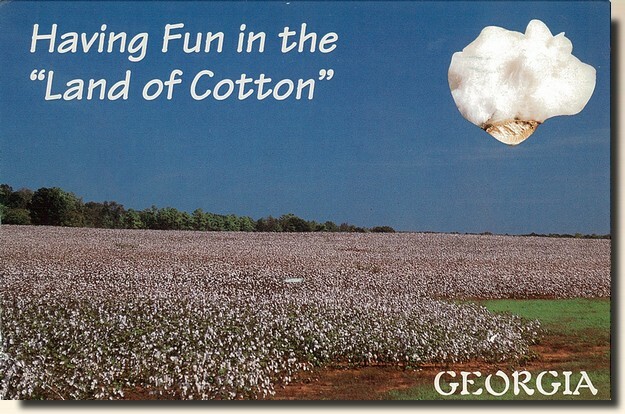 The south was referred to as the 'land of Cotton' after the intervention of the cotton girl and prior to the war between the States. Since the war, cotton has declined as a crash crop, but continues to provide a source of income to Southern industry. Gainesville is a city in Hall County in Georgia, United States of America. The population was 25,578 at the 2000 census. Census estimates for 2007 show a population of 34,818. The city is the county seat of Hall County. Because of its large number of poultry processing plants, it is often called the chicken capital of the world. Gainesville is the principal city of and is included in the Gainesville, Georgia Metropolitan Statistical Area, which is included in the Atlanta-Sandy Springs-Gainesville, Georgia-Alabama (part) Combined Statistical Area [wikipedia].